Living in Dryden: So what changes in local redistricting? Much to my surprise, I got a couple of questions over the weekend about the redistricting for the Tompkins County Legislature. I'm guessing they both originated with this article in the Ithaca Journal. As that article notes, the Independent Redistricting Commission will be holding two public hearings on the proposals, at "5:30 p.m. Jan. 31 in the Dryden Town Hall, and 5:30 p.m. Feb. 9 at the Tompkins County Public Library". For Dryden, the changes are fairly minor. The key map, the one selected (1.6MB PDF), shows small changes of territory among the three existing districts that contain pieces of Dryden. (You can compare them with the map of the current districts (2.3MB PDF)). Most of the changes are in the north, between Caswell and Malloryville roads. You can see the shift in the following two maps. Current district boundaries near Freeville. Proposed district boundaries near Freeville. 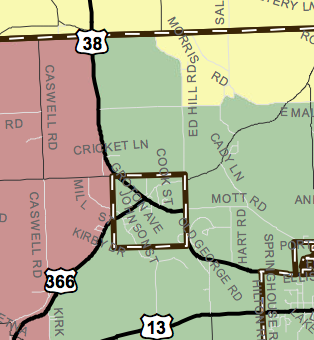 The western district moves east from Caswell Road to Route 38, the Village of Freeville boundary, and Route 366. 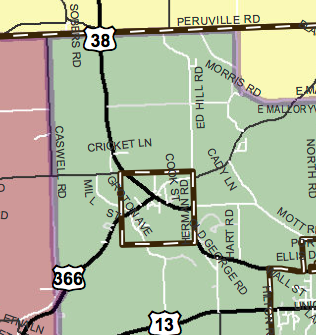 The northeastern district, which includes all of Groton and an eastern edge of Lansing, expands west from West Malloryville Road to Ed Hill Road. On the southern edge, the eastern district moves slightly west, to include some voters on Midline Road. Current district boundaries near Slaterville Springs. Proposed district boundaries near Slaterville Springs. The general rules were that districts had to stay within a 10% variation from the absolute average. All of the proposed Dryden districts are around 4.5% below the average, which means that Dryden will have slightly more sway in the county legislature than it should have. Under the old maps, the 2010 census indicated that the Groton/McLean district had fallen from 3.41% over to less than 1% over the average, the western Dryden district fell from 0.6% to 1.8% under, and the eastern Dryden district was almost 8% over the average after starting 3% over. The biggest change in the overall picture is the reduction in the size of the legislature. Instead of 15 legislators, the next legislature, to be elected in 2013, will only have 14. This made it possible for the districts to cleanly separate the Town and City of Ithaca. The full map page includes a lot of other possibilities. If you want to see what might have been,wander through the ones that don't have the orange arrow!